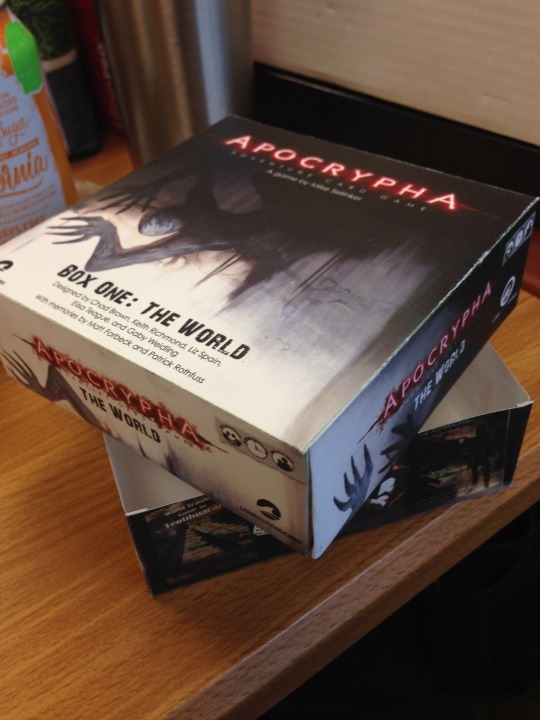 I’m happy to report that the Apocrypha Adventure Card Game base set is all finished on our end and is at the printer. Last night I checked the final proofs for every card and all the books in the game, just to make sure nothing needed to change. We’re now in the process of working with our printer to get the game toward completion. We do not yet have a return date from the printer, but will let you know when we do. This game has taken us a long time to get right, but it’s very good—probably the best set of anything we’ve ever made—and we think you’ll like it when it comes in. So, here’s something you’d probably like to know. 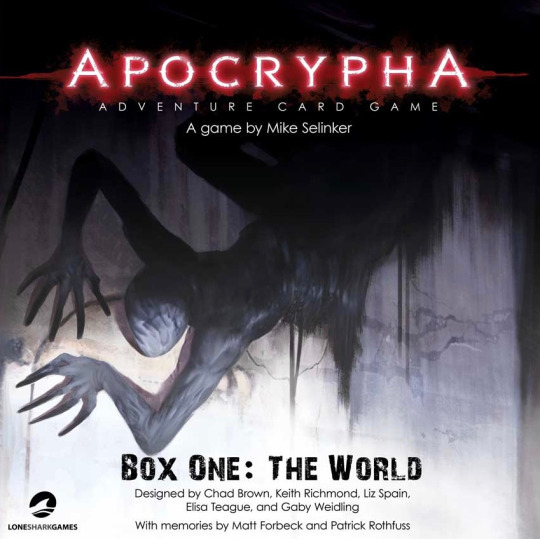 The new name of the base Apocrypha Adventure Card Game set is The World. (Or, as we sometimes call it, “the World Box.”) The World contains all the cards, dividers, pawns, bases, and books from the base set subtitled The Secrets of Candlepoint, plus The Book of the Skinwalkers chapter. Those sets are co-written with our friends Patrick Rothfuss and Matt Forbeck, two great weavers of fragmented memories. In The World, you will see the dawn of the apocalypse which you may or may not be able to stop. Box Two contains about 400 cards in four chapters (Deathless, Fae, Golems, and Physicians) and is called The Flesh. There are tons of … well, let’s call it “physical” references throughout this set. In The Flesh, people go through the wild primes of their lives, dream out loud, get sick, die … and don’t stop there. Things will get out of control fast, and you’ll have to put all your effort into riding the tide. Box Three contains 400 more cards in four more chapters (Animus, Damned, Dreamers, and Serpents) and is called The Devil. You will see all sorts of higher-level manifestations in this one. When you put Mayan dragons, time-bending sorcerers, ravenous demons, and one ticked off Mother Nature in one place, things will get serious fast. In The Devil, you won’t question the seriousness of your task, only whether or not you’re up to it. Box Three contains fragments by Keith Baker, Wolfgang Baur, Erin M. Evans, and Kij Johnson. It and Box Two will ship to backers after the base set goes out to everyone. The two expansions will be staggered at retail, though they will be sent to backers at the same time. The World. The Flesh. And The Devil. Three big boxes with three big purposes. That should keep you busy for quite some time. At least until the world ends.